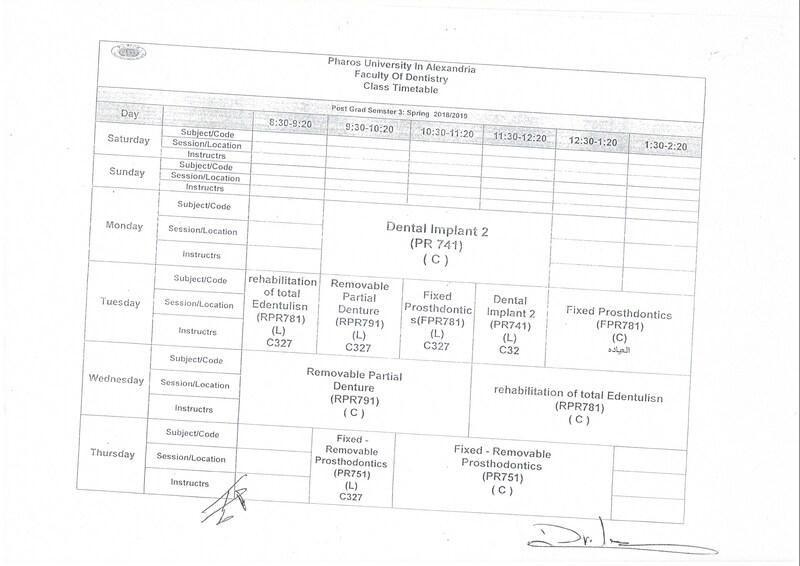 Master’s degree in Prosthodontics and Implantology. 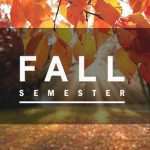 Autumn semester: – starts in October, a fifteen-week semester excluding the final exams. 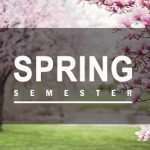 Spring semester: – starts in February, a fifteen-week semester excluding the final exams. 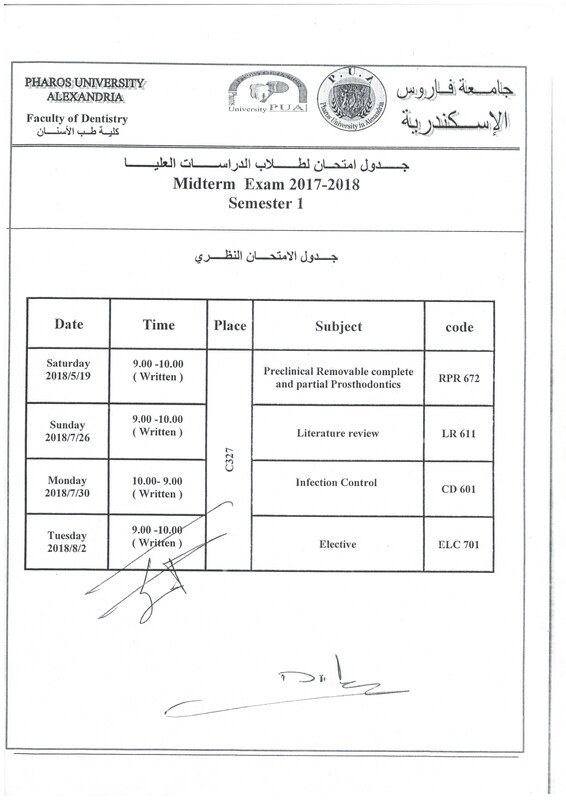 Summer semester: – starts in July, an eight-week semester, excluding the final exams. 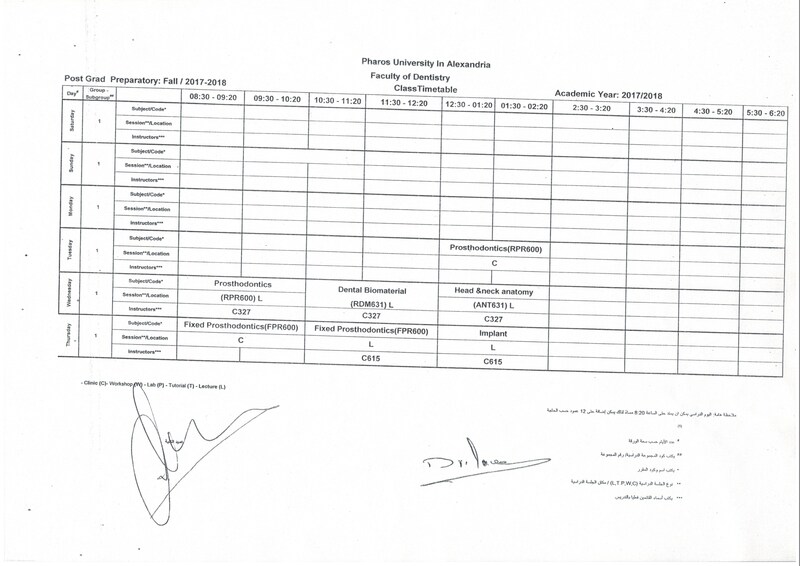 Registration takes place at the faculty, for one week, as announced before the academic year. 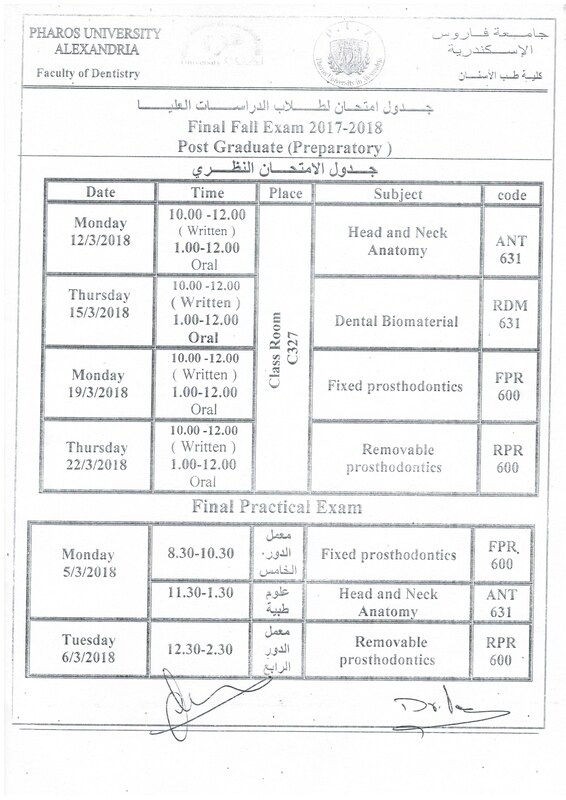 Holders of Bachelor’s degree in Dentistry and oral and dental surgery – minimum general grade Good, and Very Good in the field of specialization or the equivalent of this grade from one of the universities recognized by the Supreme Council in the field of speciality, or from an equivalent foreign university. 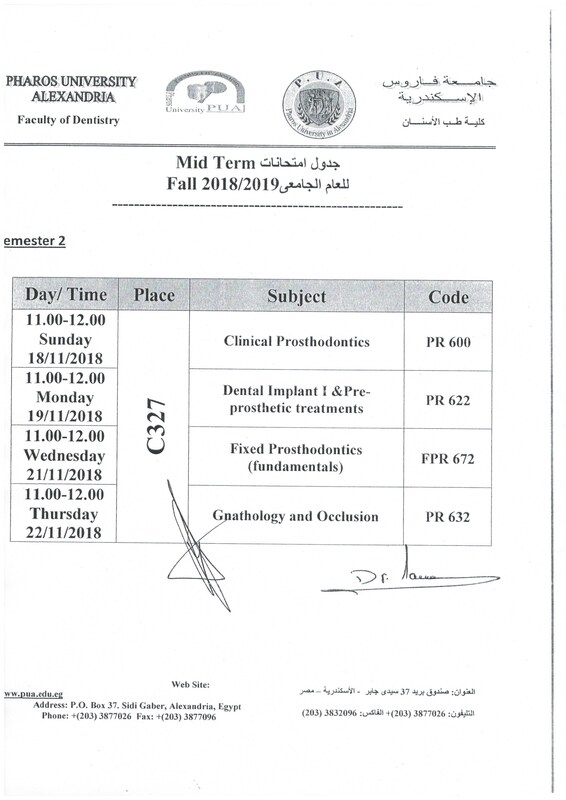 In case the applicant is granted a Pass in his bachelor’s degree and wants to register for a master’s degree, he must obtain a specialty diploma with general grade (Good) at least, or pass the complementary courses determined by the department, with a general grade no less than good and these courses are not part of the hours of the program. The student should pass a specific level in the Institutional TOEFL, as decided by the council of the faculty. 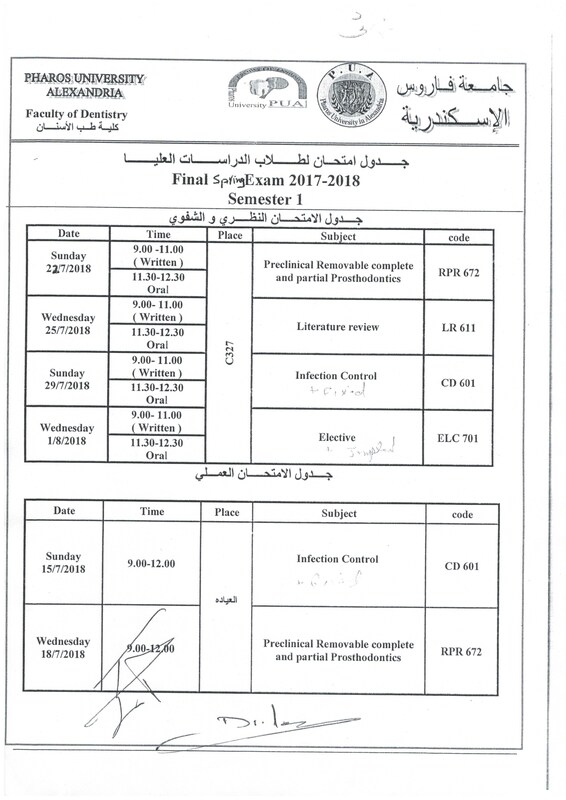 42 credit hours for the courses, in addition to 8 credit hours for the thesis, total of which is 50 credit hours, according to the study plan. Minimum 2 years after registration to obtain Master’s Degree. 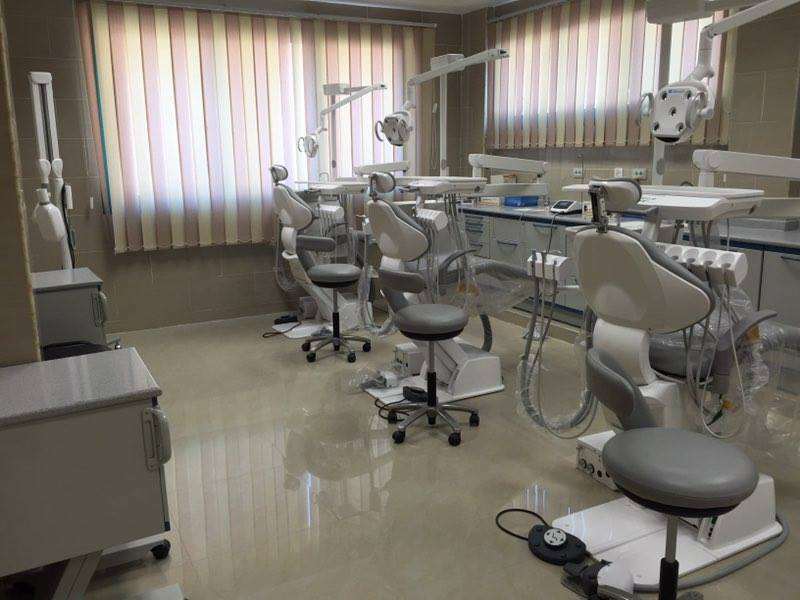 Includes conservative dentistry, fixed Prosthodontics and Implant, removable Prosthodontics and Endodontics. 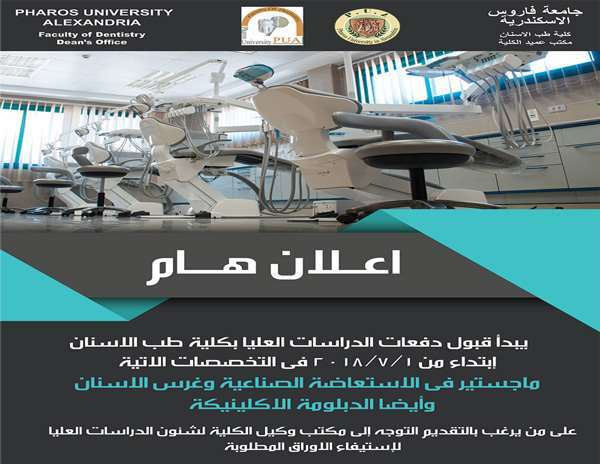 Holders of Bachelor’s degree in Dentistry and oral and dental surgery or the equivalent from one of the universities recognized by the Supreme Council in the field of specialty, or from an equivalent foreign university. 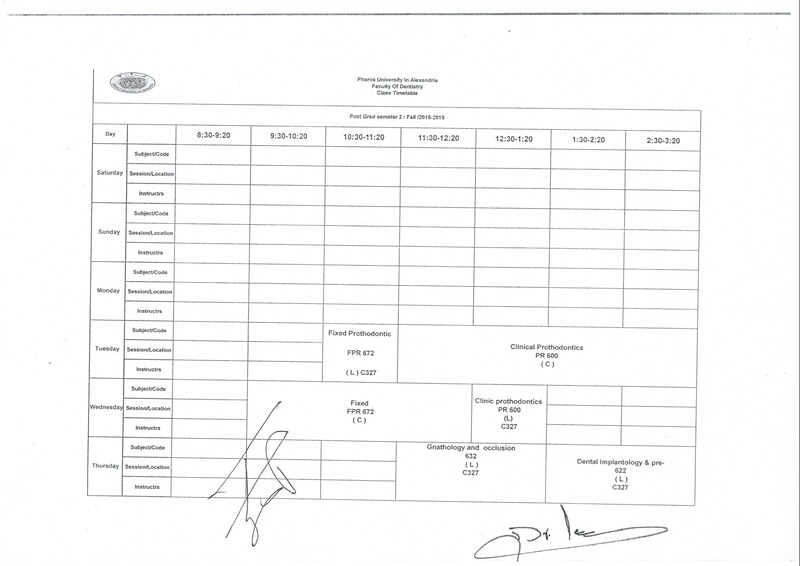 44 credit hours, including 9 credit hours for the preliminary mandatory semester, according to the study plan. 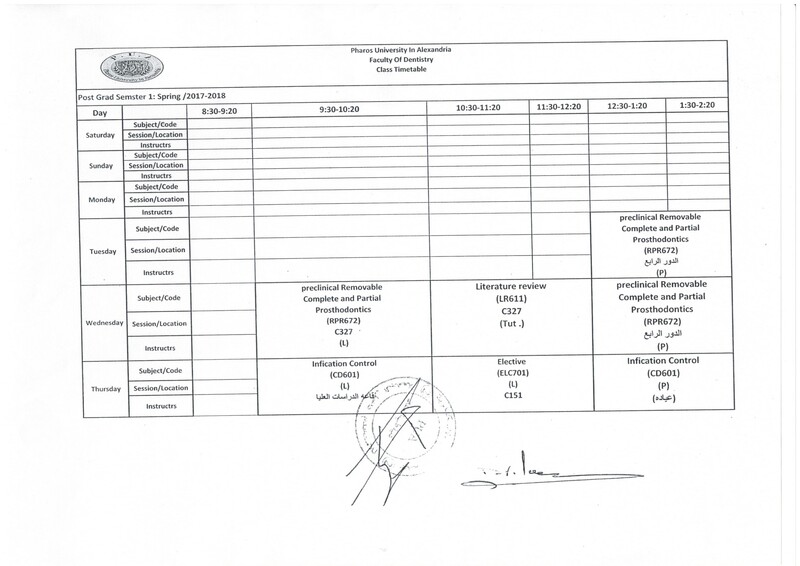 No less that grade (C) should be obtained in the subjects studied. A bachelor’s degree certificate or its equivalent. The approval of the employer that allows the student to study two days every week, and to be renewed annually throughout study years. An extinguished group of Egyptian professors of dentistry in the field of prosthodontics (fixed and removable) and Implantology. 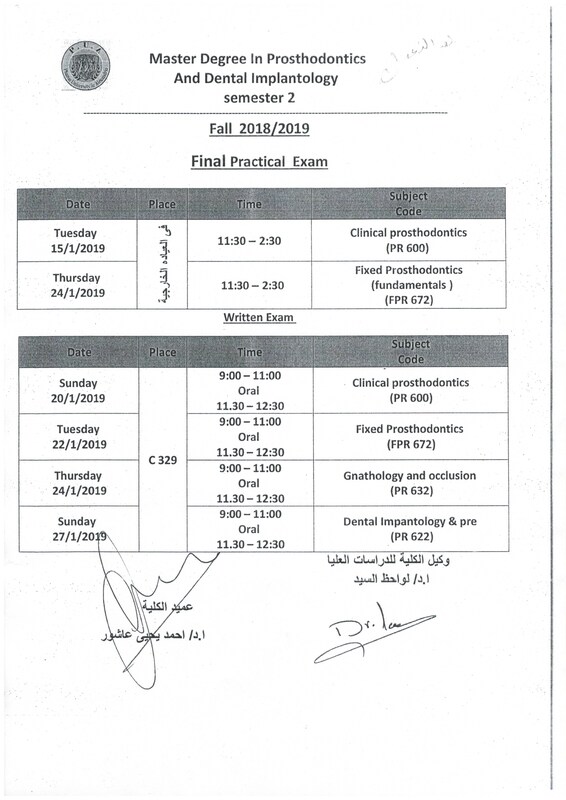 A syllabus that keeps pace with global development in the field of implantology, bone grafting and jaw building. 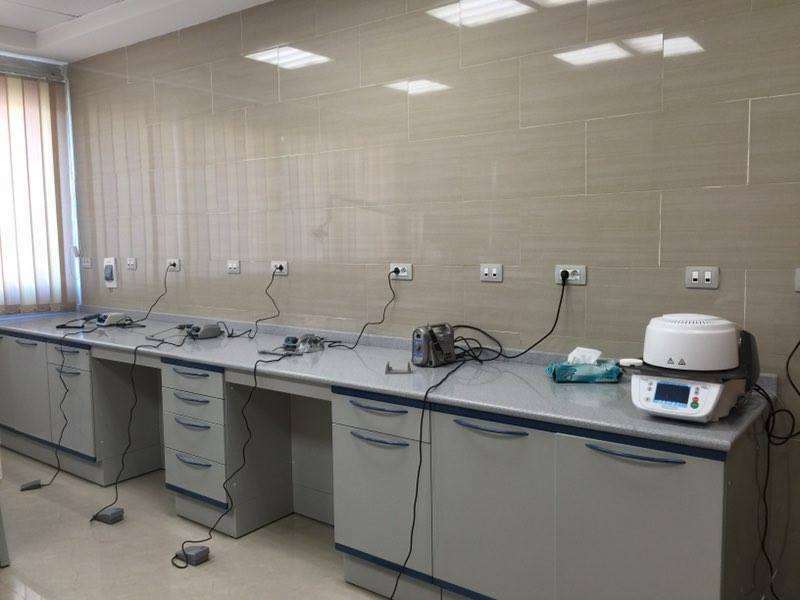 A special building for postgraduate studies and new clinics equipped with the latest dental units with all facilities. 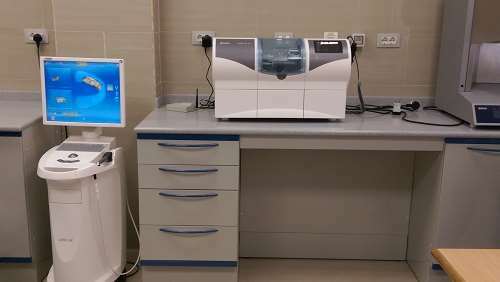 A high standard diagnosis unit that includes a three-dimensional computed cone beam. 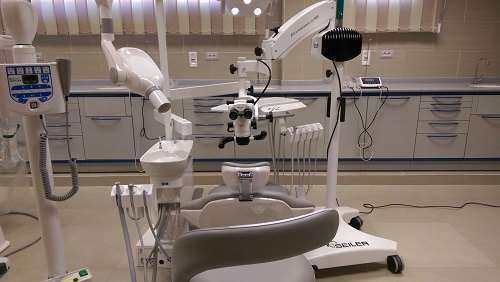 The newest means in the field of dentistry, and fixed crowns and bridges. Equipped halls for teaching post- graduate students. Training on surgical microscope for endodontic treatment. Latest prosthodontics after implant procedures. Issuing a specialized research journal for post-graduate students.